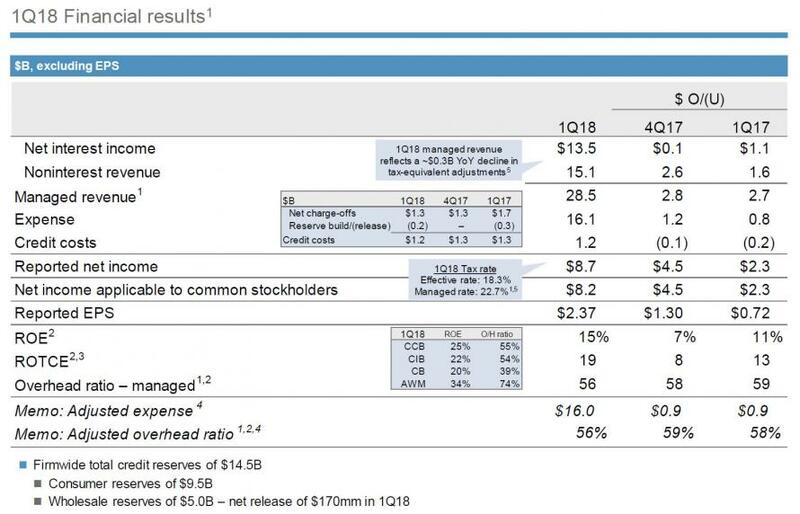 Unofficially launching the Q1 earnings season (technically PNC was first), moments ago JPMorgan reported Q1 earnings which beat on both the top and bottom line, with revenue of $28.5BN above the $27.68BN consensus est (and above the highest sellside estimate of $28.23BN), generating EPS of $2.37, also beating expectations of a $2.28 print. The key at the summary level, however, is that JPM’s income tax expense decreased by approximately $240 million despite a $2.0 billion increase in pre-tax income, reflecting the lower income tax rate as a result of the enactment of the Tax Cuts & Jobs Act i.e. Trump tax reforms. The bank also reported a provision for credit losses of $1.165BN in Q1, well below the $1.46BN estimated, and 11% lower than the $1.308BN recorded in Q4 and $1.315BN one year ago. At the same time, charge-offs climbed by $100 million to $1.3 billion in the quarter, mostly driven by an increase in souring credit card loans, which jumped 18% Y/Y from $993MM to $1.170BN. As a result, the charge-off rate in card rose to 3.32%. As Bloomberg notes, the bank had said the charge-off rate for the year in cards would be 2.95%, so analysts might have some questions about whether that target will need to come up based on these numbers. 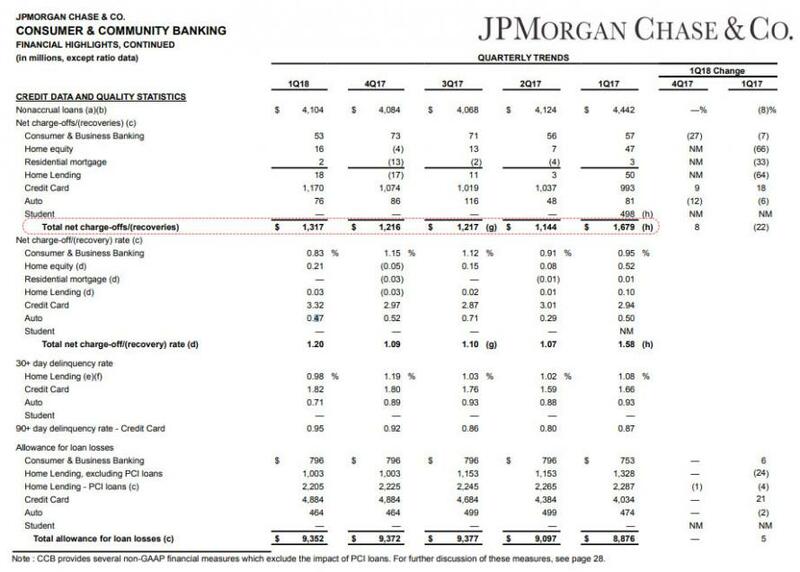 JPM Vs. WFC: Which Is The Better Bank Stock Ahead Of Earnings?